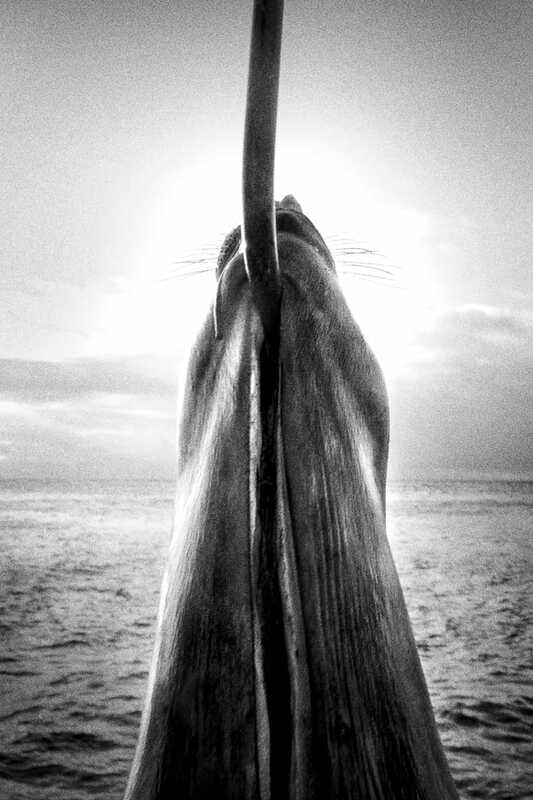 For the past four years, Yoanis Menge, has been following the lives of seal hunters in Magdalens Islands, where he resides, Newfoundland and Nunavut in hope of showing the other side of a practice so often stigmatised in the media. The activity, criticized by so many activists, is an integral part of the region’s heritage and an important source of revenue for its residents. 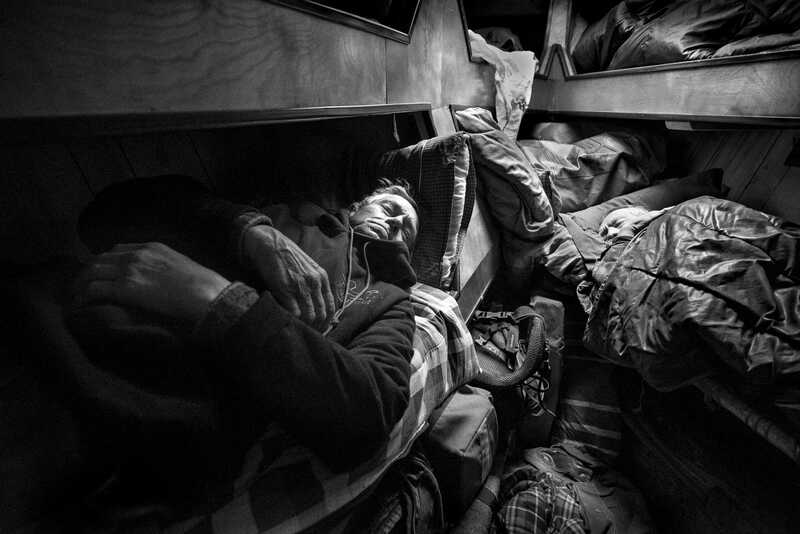 Below, the Quebec photographer shares his approach and what he’s learned in the course of making this essay. His story is accompanied by the testimonies of Gil Thériault, a self-declared pro-hunting activist, Dr. Pierre-Yves Daoust, a wildlife veterinarian and Denis Cormier, a hunter and fisherman. 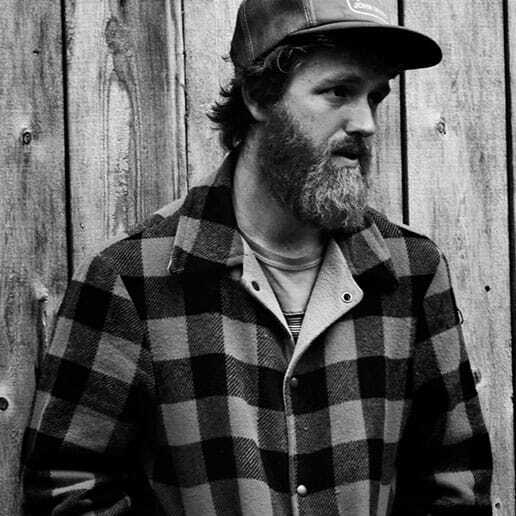 “In a way, hunting has always been part of my life. 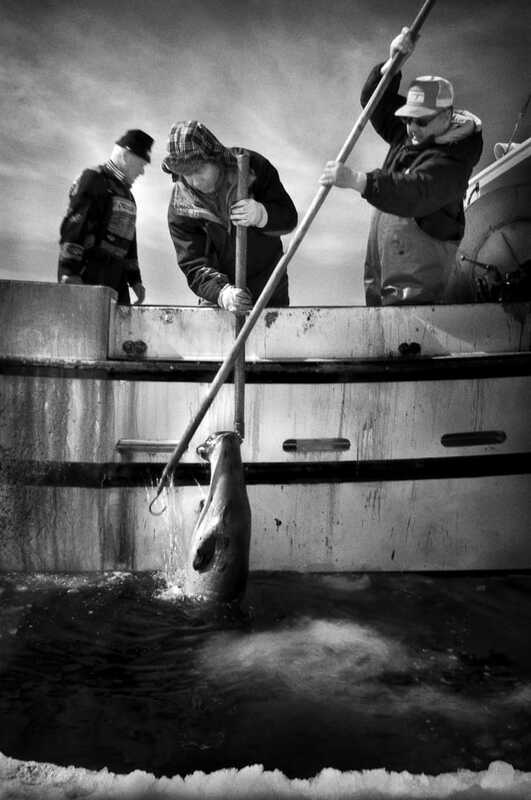 My dad took me hunting small game and my mom came from the Magdalens Islands, a place where seal where coveted preys. Even though I’d never hunted them, I understood that it was an important economic activity for the region. Hence, when I found myself starring at a poster of the Brigitte Bardot foundation in the Paris metro, I was shocked. It showed a model dressed in a sealskin coat holding a hakapik — the club used for killing seal — that looked more like scythe than anything else and a young seal next to her. She was looking at him, saying: “Look how fancy I am. It’s well worth your sacrifice”. 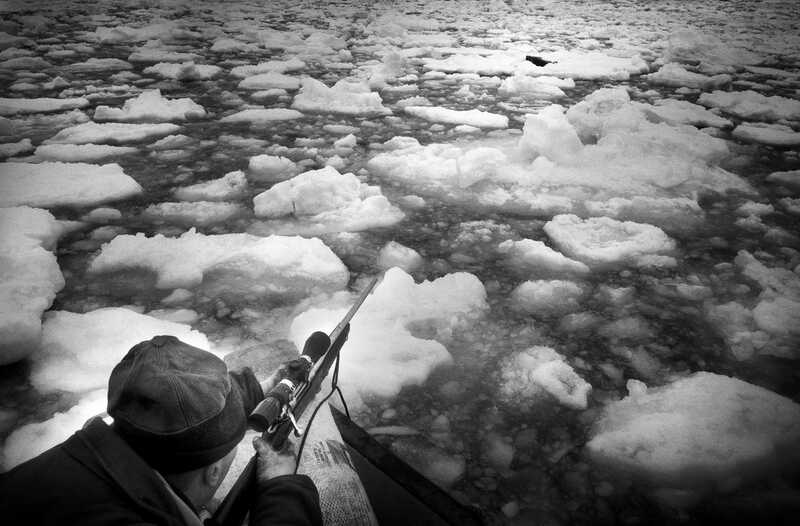 The goal of the ad, which associated seal hunting with the bourgeoisie, was to get European governments to ban seal products. It unsettled me. I couldn’t bear that people from the Islands, from Newfoundland and the region, who struggle to make ends meet, were being represented as barbarians. Researching existing photo-essays on the matter, I found only scathing ones. The other side, the perspective of the hunters, was scarcely shown, perhaps because it requires a bigger commitment. On the one hand, you have to gain the hunters’ trust, which is not easy given the damages that media has caused them back in the days when they were not aware of the power of images. In his movie “Le massacre des innocents” (The massacre of the innocents), Serge Deyglun treats Madelinots as if they were savages. A stressful and dramatizing soundtrack accompanies the footage. He even went as far as paying a hunter to disembowel a live seal. But no one here does that. And, on the other hand, in order to be on the boats, you need a hunting permit. Otherwise, all you get is an observation one, which only allows you to approach the seals up to 10 meters. Therefore, up until now, most of the photographs were taken with a zoom lens, as if taken by paparazzi. I wanted to do things differently. 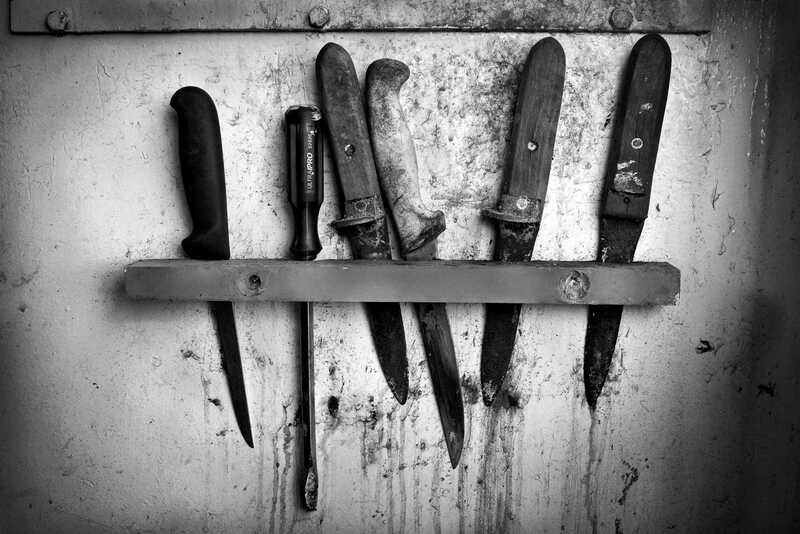 I felt I had to truly experience the hunt, to be as close as I could be to show what the job entailed, the associated risks and all the repetitive gestures that have been passed down through hundreds, or even thousands of years. I wanted to honour these men and to keep a trace of their know-how. So, I learned how to seal hunt. Entry Island, Magdalens Islands, Quebec, 2015. 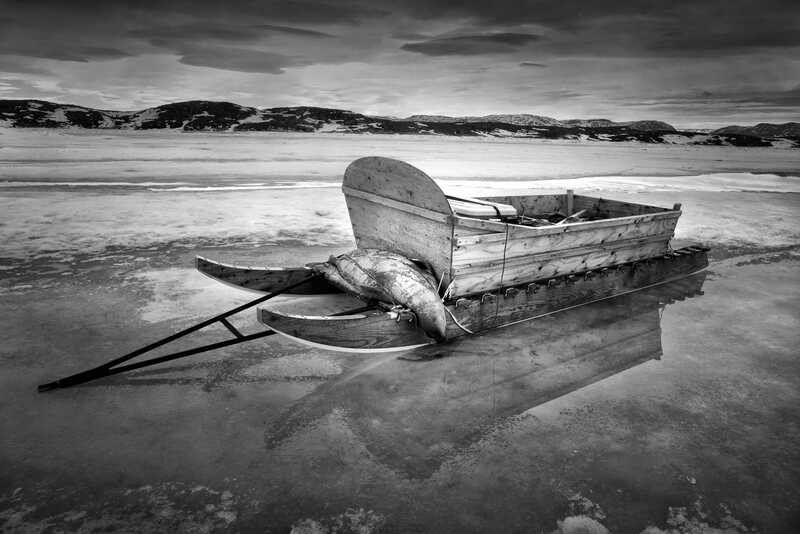 Life on the ice is really different than what urban dwellers imagine. Seals are far from being extinct; quite the opposite, actually. Since the 70s, in the Gulf of the Saint Lawrence River, the herd has grown from 1.5 million to 7.8 million because there are almost no predators. Men were one of them, but low quotas now restrict how much they can catch: more or less 5% of the total population. And, there are less and less hunters. Up until 2008, sealskin was worth 100$, which is a significant revenue for people on the Islands. However, since the European boycott, prices have gone down. Sealskin now goes for less than 30$. Little by little, the trade disappears. It’s becoming artisanal. Meanwhile, it’s important to note that a seal eats about 1.5 ton of fish and shellfish per year, essentially fifteen times the amount of seafood caught by the entire Eastern Canada fishing fleet. So, there’s an enormous pressure on the marine ecosystem of the region. It can’t renew itself. And as the fish stock declines, so do the fishing revenue. It’s a vicious circle. Last year, only a hundred or so seals were killed on the Islands. There was too much ice. The older folks hadn’t seen so much of it in 50 years. Since the seals were far away, it cost more to get to them than they were worth. It wasn’t lucrative. Gil Thériault, director of the association of seal hunters and director of the office for the management of the Atlantic seal. “From the start, Yoanis invested himself fully, with discernment and humility. He became a hunter. And, I would even go as far as saying that he’s amongst good hunters in the Magdalens Islands. He learned the trade the way the youth ought to learn it. In the old days, all that mattered was the skin. Now, the meat is a worthy product as well. You have to be skilled and save everything. If you damage the skin, it loses value. But, if you puncture the intestines and contaminate the meat, you can’t sell it. You lose everything. Yoanis is a conscientious photographer. In a way, he hunts like he takes pictures. He’s meticulous and focused. 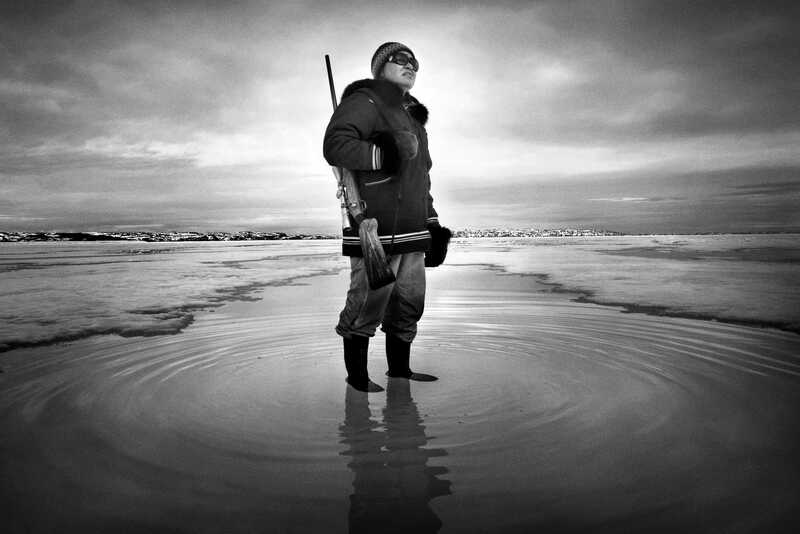 His work contributes to reframing the discourse around seal hunting. He shows that killing is only a small part of the trade and that you need both know-how and courage to practice it. For instance, hunters are skilled snipers. They can hit a target the size of a quarter from 500 feet while their boat rocks and the ice moves. I really like the image of the hunter jumping on the ice floats that span all the way to the horizons. It reminds us how small man is against nature and of the dangers that awaits those who venture out. 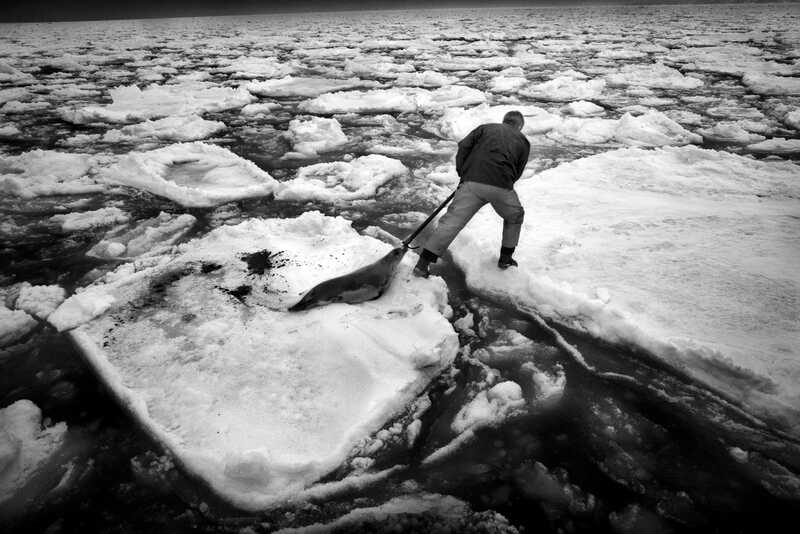 If he falls, he’ll plunge into metres and metres of frozen black waters. 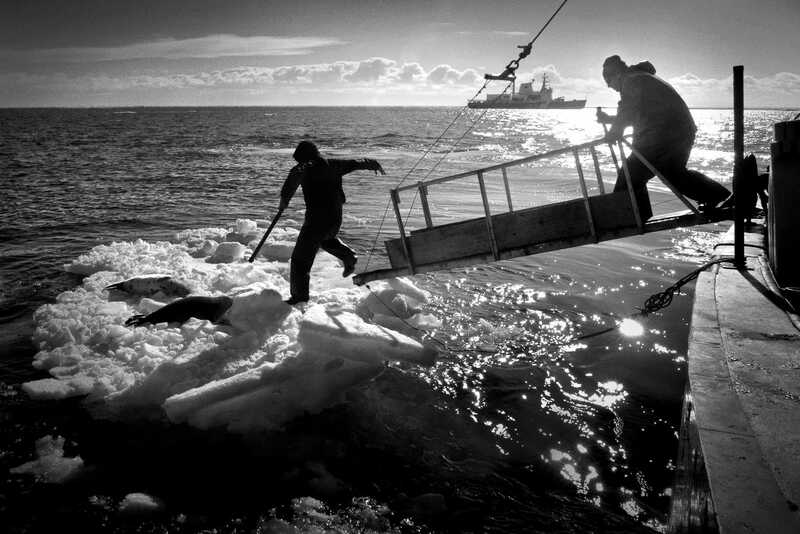 Seal hunters are like stuntmen. Few will argue against the value of wildlife conservation, but views about its consumptive use can be conflicting. Those who oppose it often forget its human side, and Yoanis’ work is critical in reminding us of this element. There are so many situations worldwide where people still rely for their sustenance on natural resources in their immediate surrounding. This is well understood in northern Canada, where wildlife is a precious resource for Inuit communities. No one should deny the social, cultural, and economic importance of hunting in that region, irrespective of the species involved, whether it’s caribou, seals or whales. This may not be so obvious further South, where sealing has been going on for hundreds of years. 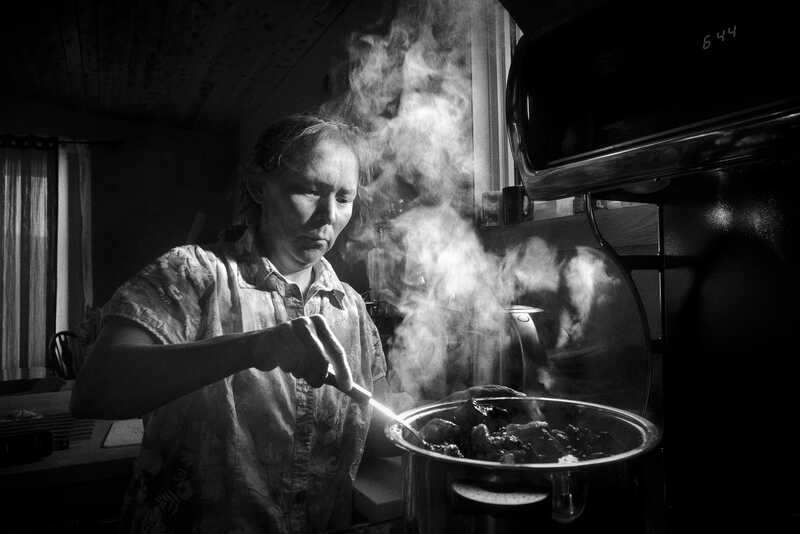 Even today, sealing remains for people of coastal communities in southern Canada a socially, culturally, and economically important activity, as it does for Inuit communities in the Canadian North. 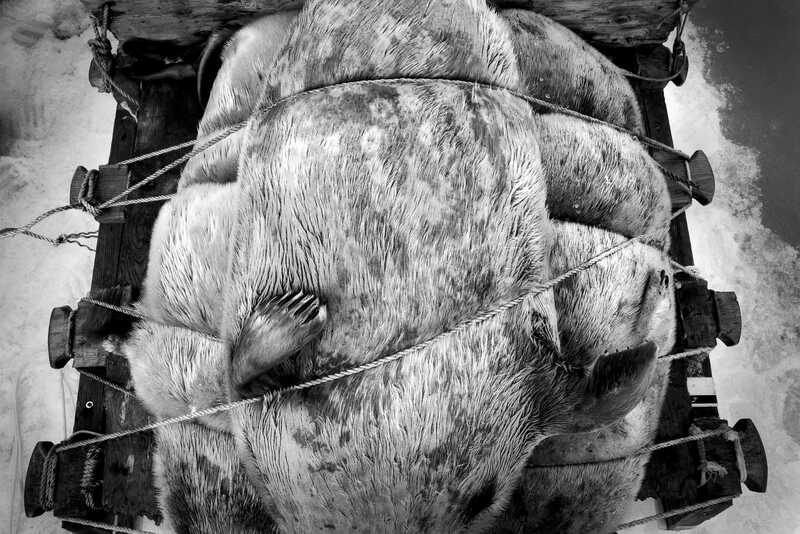 Inuit hunters have a totally unique traditional ecological knowledge based on thousands of years of experience, but so do sealers in southern Canada, where this knowledge has been gathered over hundreds of years. Through my work to promote standards of animal welfare during the hunt, I have seen for myself, both in northern and southern Canada, the multiple skills of hunters, perfectly adapted to their unique and often very harsh environment. This combination of skills is unmatched by most of us in this country. If for no other reason, they deserve our deepest respect. “Yoanis came onboard my crew. He’s some you can trust. He’s serious. 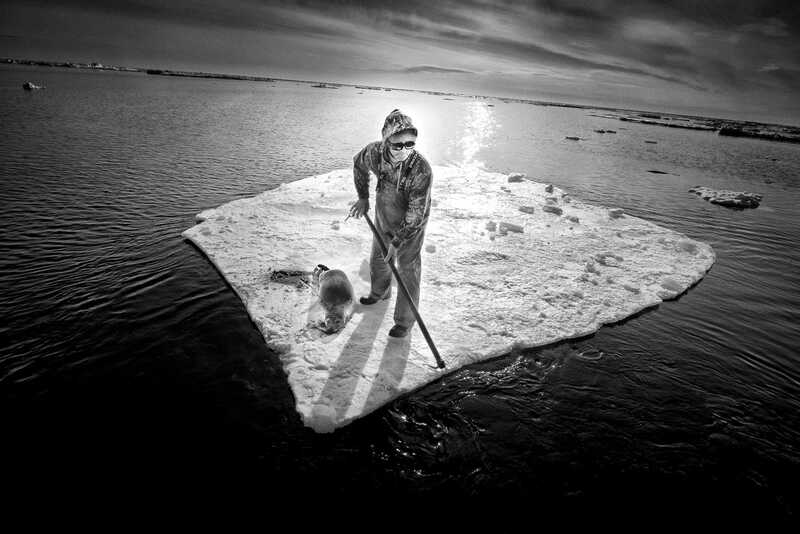 He told us about his work: take black and white pictures of the seal hunt to show that it’s a job worth doing. We don’t kill because we have the urge to. 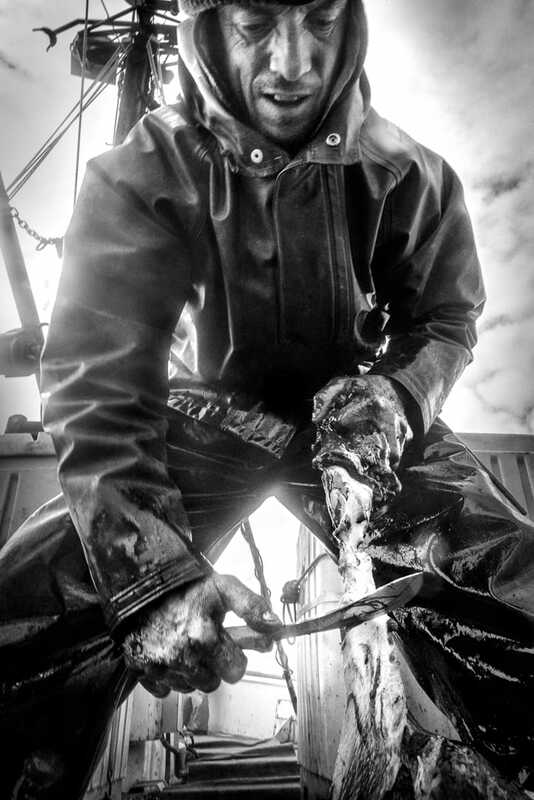 We do it to make a little bit of money that gets invested in our fishing activities. 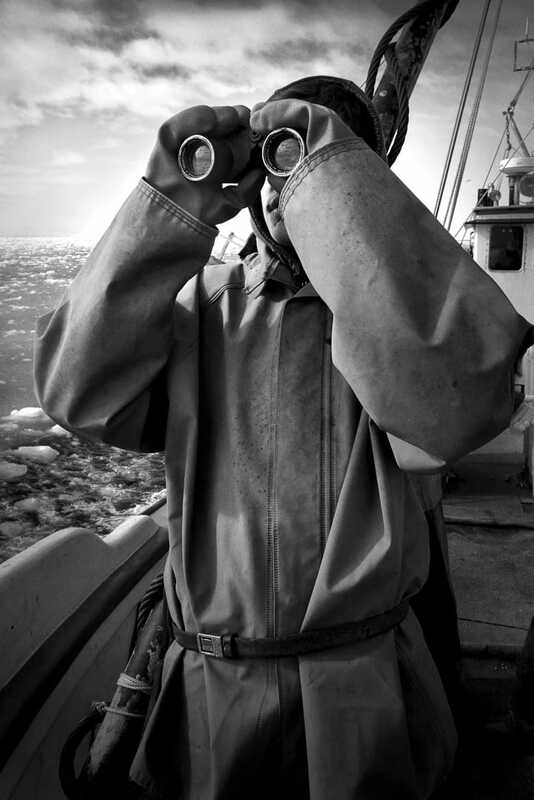 For two weeks, at the beginning of the spring, we hunt seal. It helps us get afloat. But, because of the European boycott, there’s no longer a market for our products. Therefore, less and less youth learn the trade. If the know-how isn’t passed on, it’ll disappear completely. It’s a shame. It’s part of our traditions. The book «HAKAPIK», with a text by Michel Campeau and an interview with the photographer by Serge Allaire is available through éditions La Morue Verte and in bookstores. 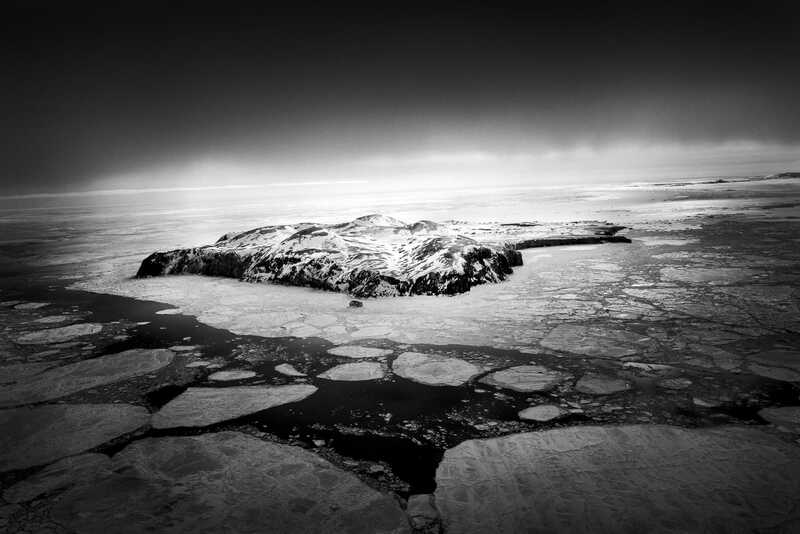 Born in 1981 with both Swiss and Canadien citizenship, Yoanis Menge, studied photography at the Cégep de Matane. In 2002, he produced his first photo essay on the topic of prostitution in El Salvador. He then pursued his training at the Magnum agency, assisting photographers Josef Koudelka and Bruno Barbey. Yoanis’ artistic practice his grounded in a documentary approach and he’s concerned with the different aspects of the geographical and social landscape where he lives. 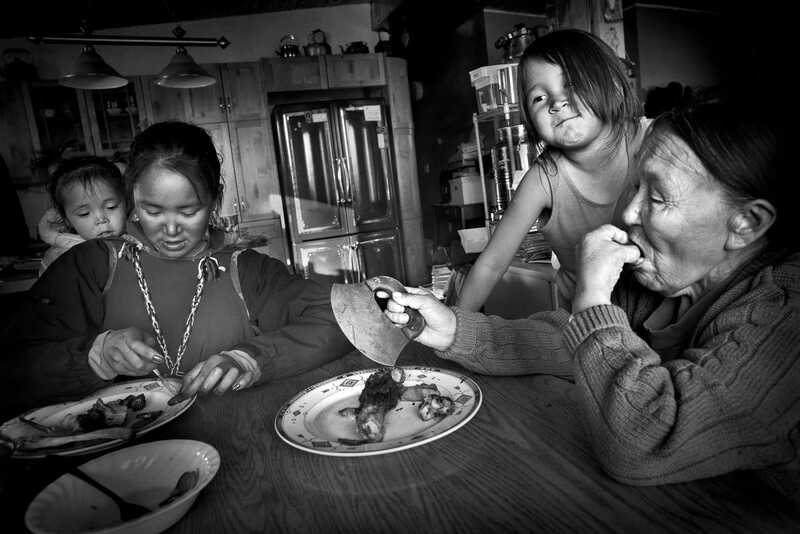 A member of the Quebec photographers collective Kahem, he works and lives with his family in Magdalens Islands. 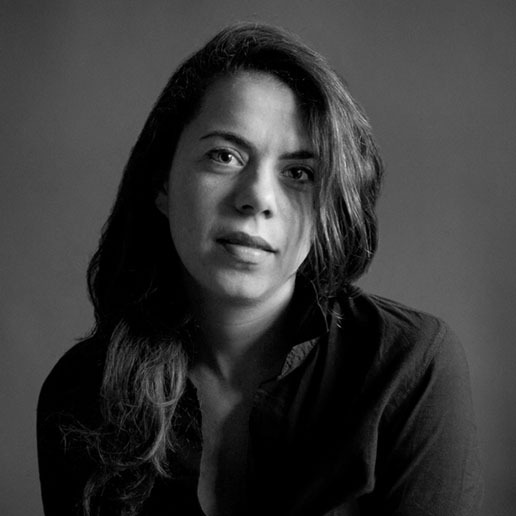 After falling in love with journalism through “Scoop”, a Quebec sitcom set inside a newsroom, Laurence Butet-Roch studied international relations at the University of British Columbia and photography at the School of Photographic Arts: Ottawa that led her to become a photographer with the Boreal Collective, a photo editor and a writer. Mindful of the evolving media ecology, she is currently pursuing a Master of Digital Media at Ryerson University.